Being a mom is often a thankless job. Sure, there are plenty of hugs and kisses and the occasional “I love you” given but moms deserve more pampering and celebration! 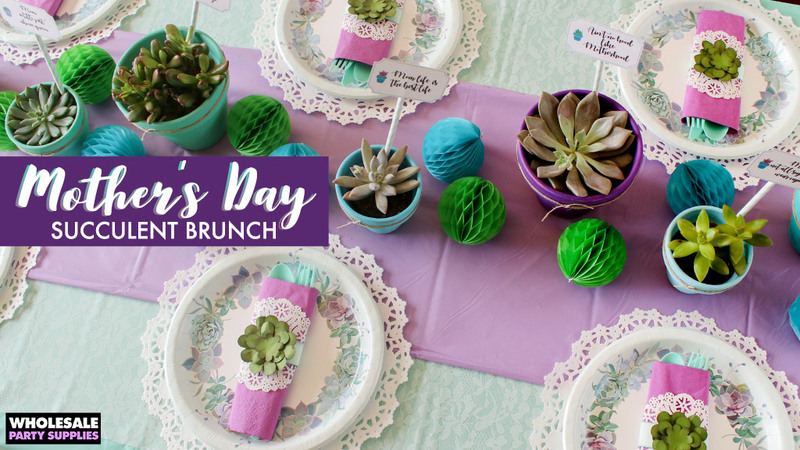 This spring consider hosting a Mother’s Day brunch celebrating awesome moms in your life! 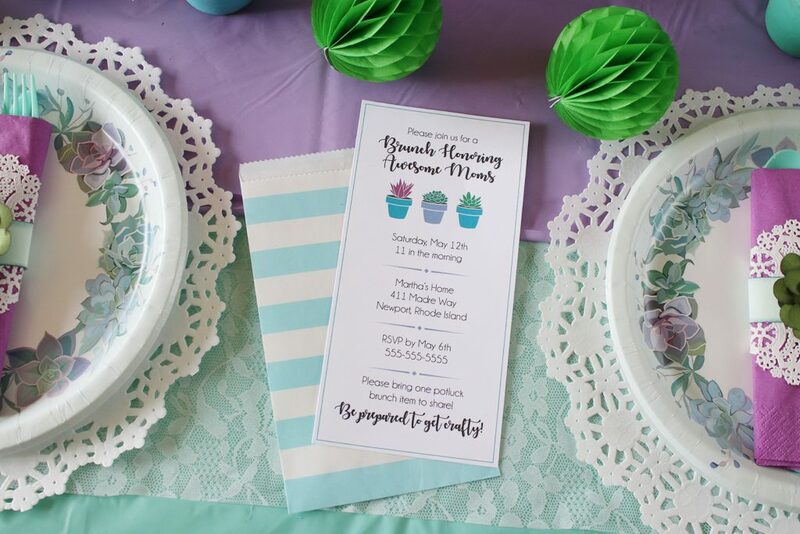 Whether it’s your own mom or grandmother, the sweet neighbor that’s like a second mom to your kids, or the class mom who always comes up with fun celebrations for school, you can celebrate these moms with a special brunch! 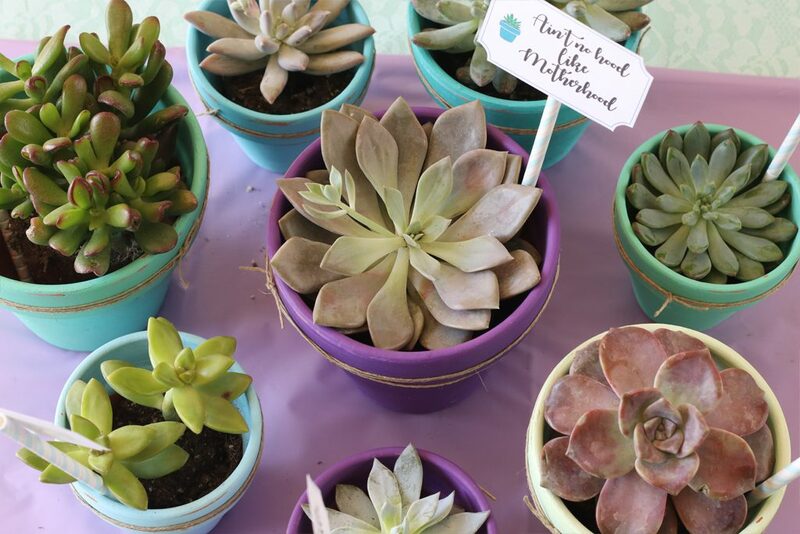 See how to use colorful succulents as your inspiration to your party décor and how to mix cool colored solid prints with soft lace for a bohemian and desert-inspired tablescape. This post was written, styled and shot by Tara at Spot of Tea Designs. Stop by her blog to see what’s blooming! Skip the boring white envelope and send your brunch invitation in a striped treat bag instead. Make sure to list any special requests, like bringing a potluck item, right on the invite. 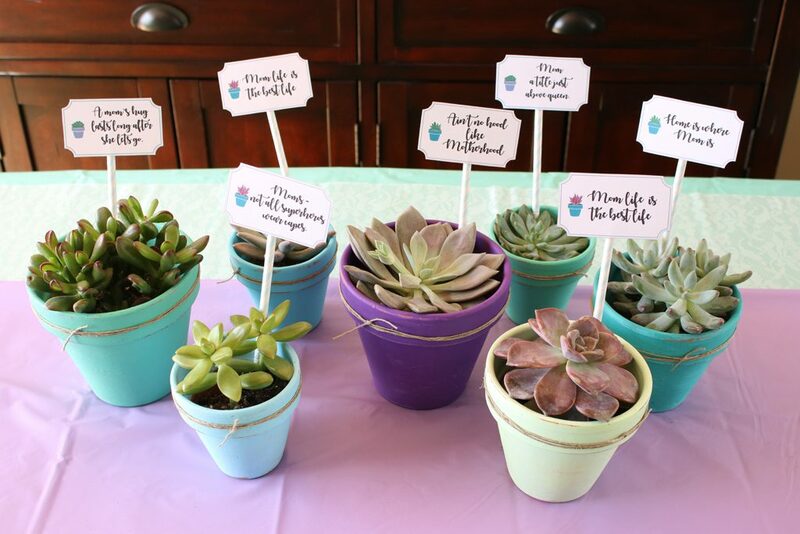 While succulents naturally come from dry, desert areas, you can grow and care for them any place in the country. 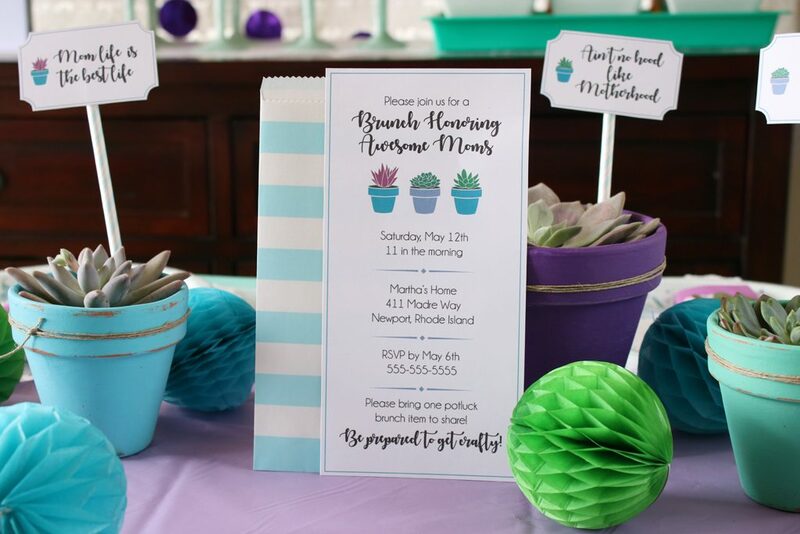 Skip the too tall for the table flowers that will wilt within days and instead use this cool colored and trendy style of plants as inspiration for your Mother’s Day brunch. 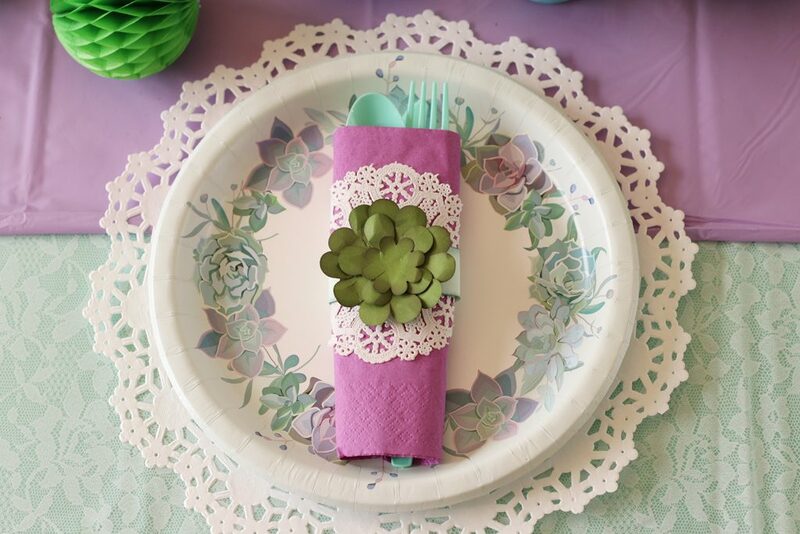 Layer solid tablecloths and a plastic lace style as a table runner to add texture to your table. Paint and distress colorful pots and stage them down the center of the main eating table. 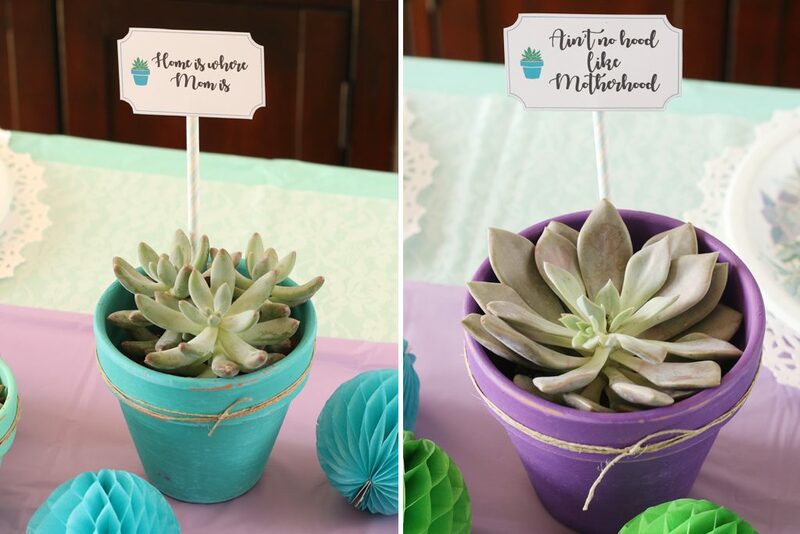 Bring in the Mother’s Day spirit with positive quotes about #momlife inside these floral centerpieces using a paper straw as a dowel. Tip: if you need to add more to your centerpiece to help fill the gaps and add color, consider separating these honeycombs and scattering them about the table. 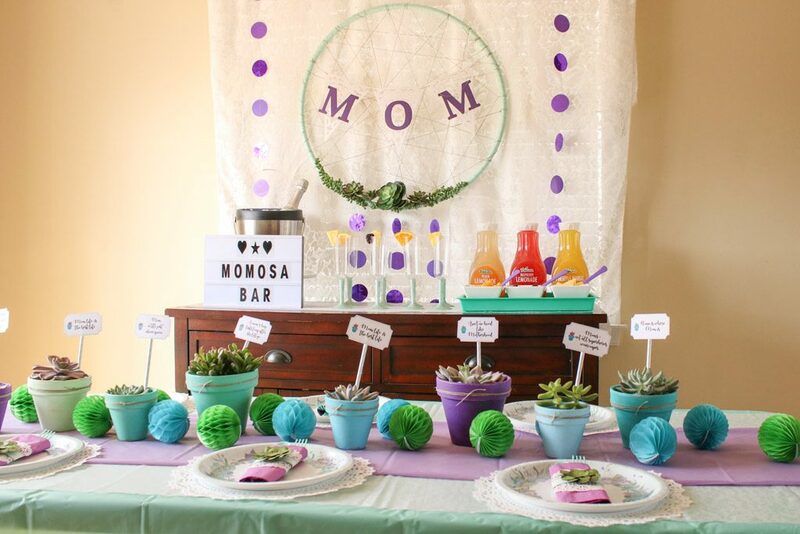 These beautiful succulent themed plates work perfectly for this party theme! 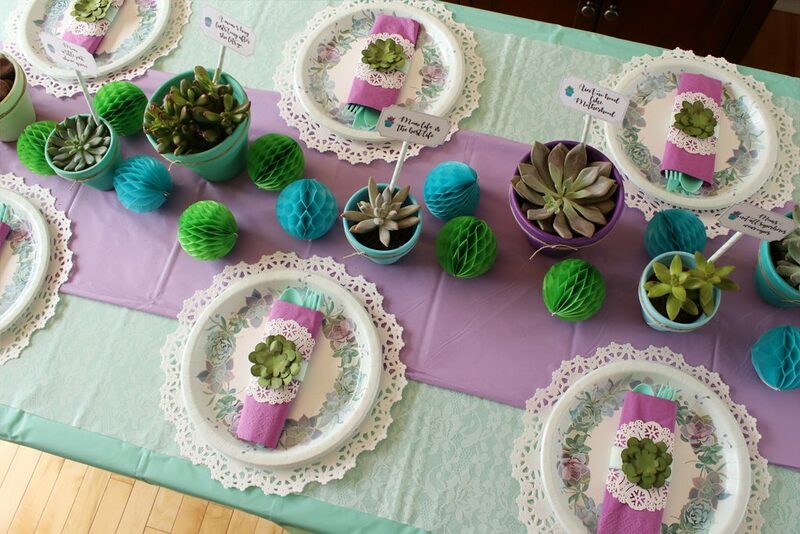 Use them on your table along with pretty doily wrapped napkin rings that feature a paper succulent. 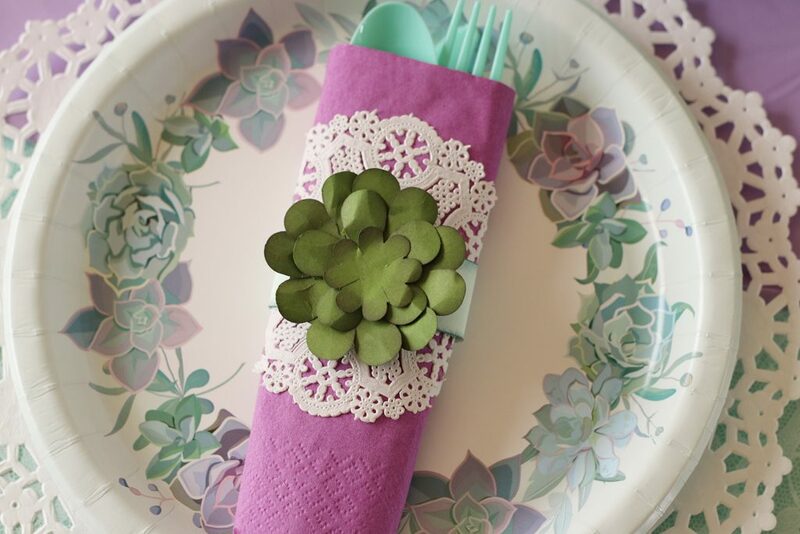 Learn how to make these faux florals from cardstock to add to your beautiful tablescape. 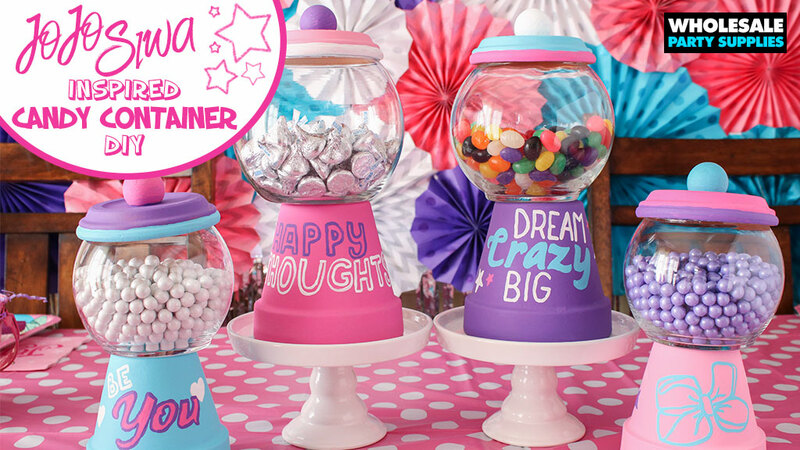 This adults-only party doesn’t need millions of balloons flying high to create a vertical appeal to your party space. Instead, hang a lace tablecloth or curtain behind your food/drink station and finish the look with a fun bohemian inspired hula hoop wreath. Learn how to make this giant dreamcatcher wreath filled with different textural elements. 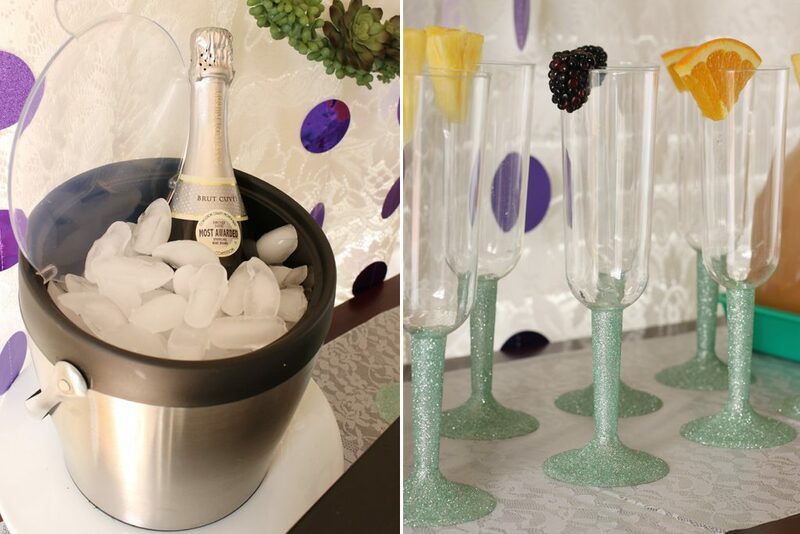 This get together might be held in the daytime but you can still pop the bubbly! 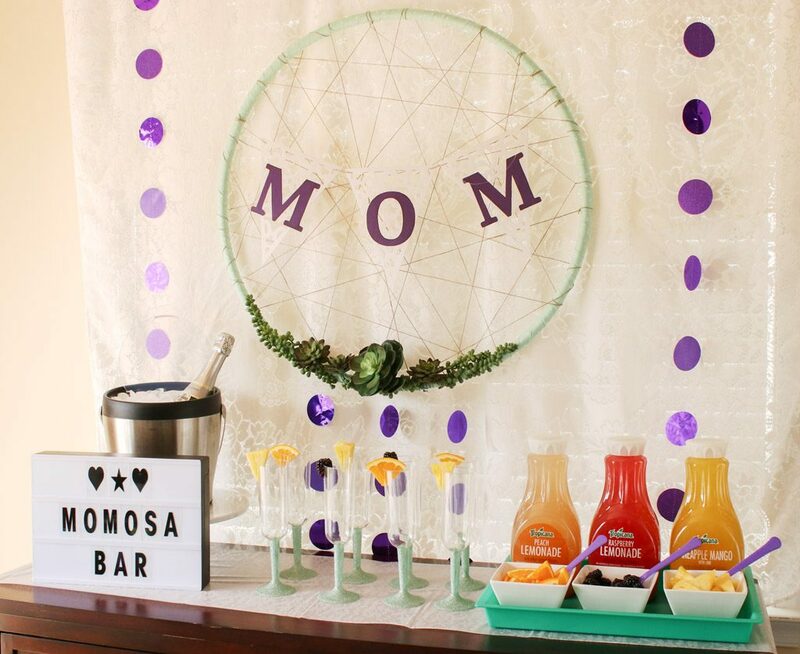 Create a fun MOMosa bar full of champagne, fruity drinks and fresh fruits. 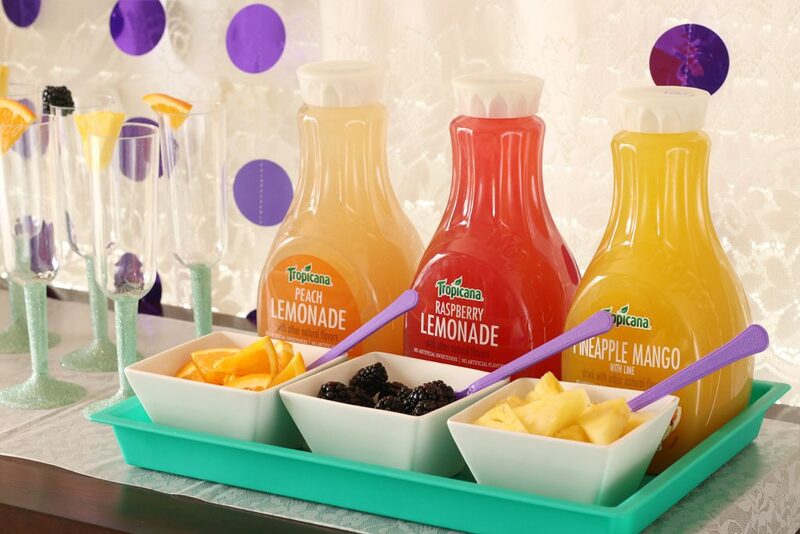 Encourage guests to make their own creation by pouring the champs, splashing on fruit juice and garnishing with an array of sliced fruit. Use your lightbox to state your station’s purpose and fill the counter with delicious fruit toppings. Dress up those boring flute glasses with some decoupaged glitter on the stem to add more pops of color and sparkle, something all moms love! Since this party is a celebration of fellow awesome moms (and no mom wants to be stuck in the kitchen the whole party) encourage guests to bring a brunch potluck item to share. No doubt your guests will be scouring their Pinterest boards for yummy brunch plates, like breakfast casserole, a beautiful fruit tart, breakfast burrito bites, or Monkey Bread to share with their friends. DIY spring wreath – teach how to use floral wire to add faux flowers and accents to a twig wreath to add to their front door this spring. 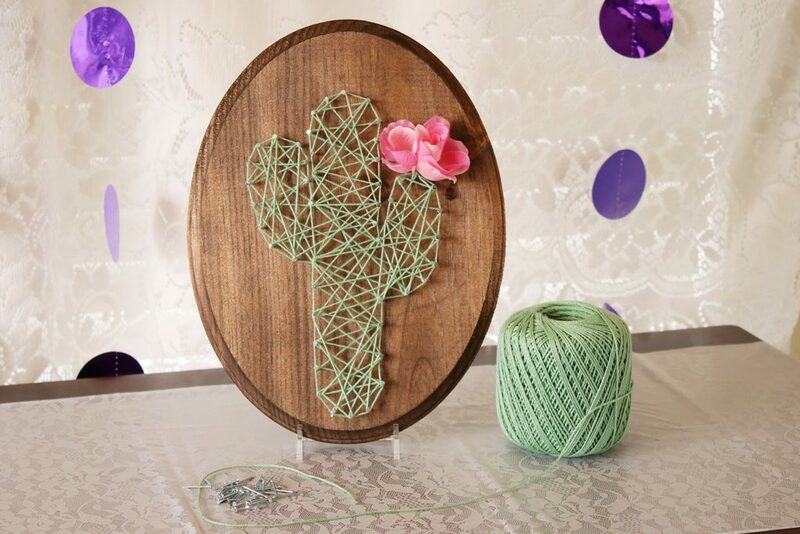 DIY String Art – Prior to the party pre-stain their wood plaques and print out a few design templates. 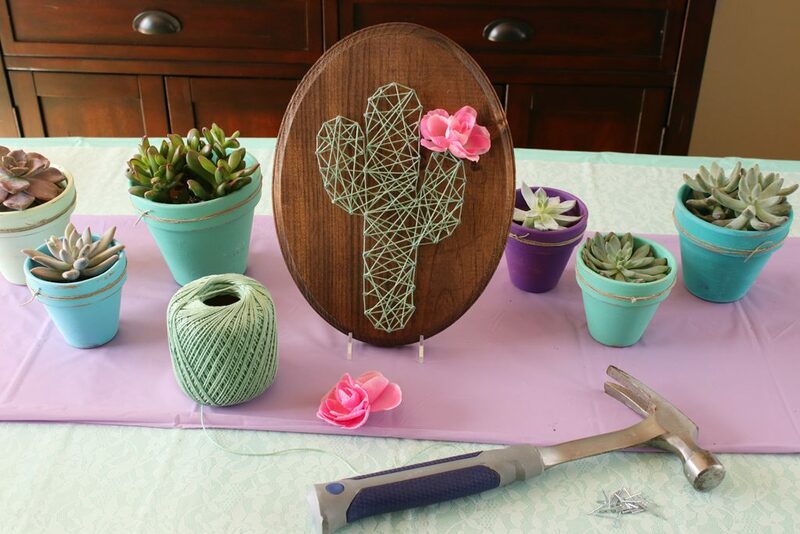 At the party, guests can then spend some time hammering and wrapping their boards to create custom string art designs as a new piece of wall art. Paint mason jars – Have the women hone in on their inner Joanna Gaines to paint and distress a mason jar to use as a farmhouse style vase when they head back home. Your fellow mom friends will leave your brunch feeling full, both in their bellies and their creative spirit from your fun craft activity. 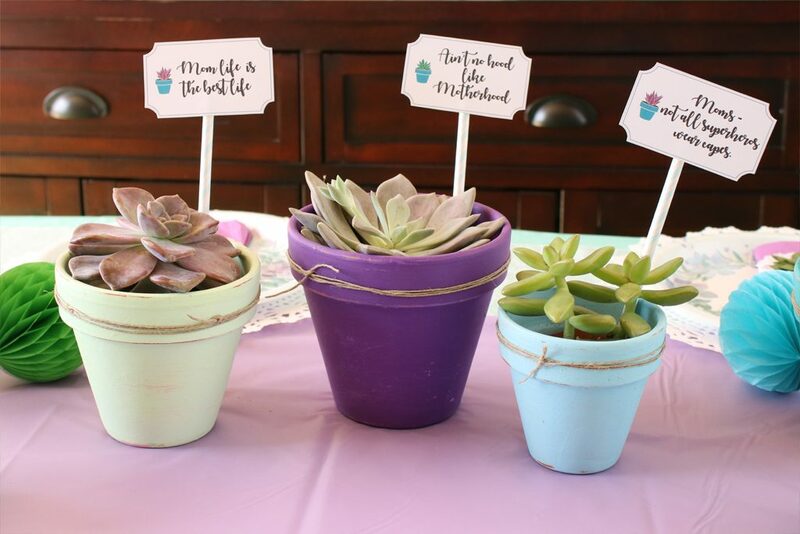 Make sure they don’t leave empty-handed either and encourage them to take home one of your cute potted plants used as the centerpiece of your eating table.